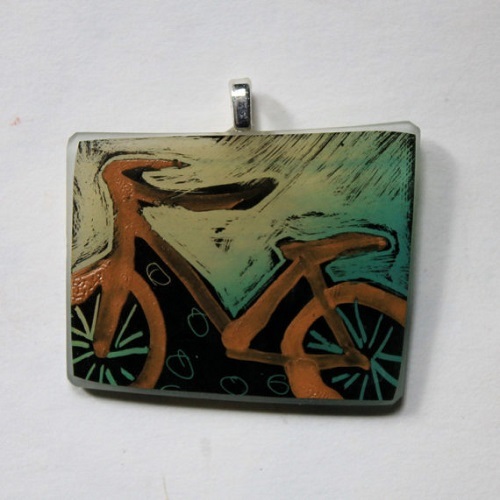 I first met Heather Wood of The Bridge Studio, a local glass artist at a Guelph, Ontario craft show. 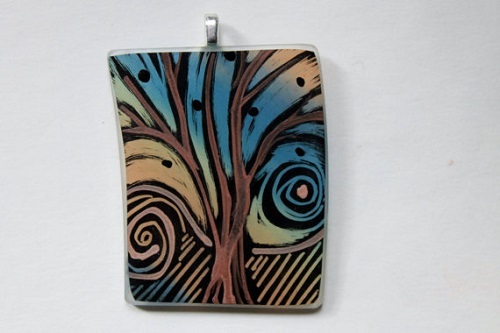 Her original handpainted art work is so lovely that I bought a pendant for myself! Nature is often an inspiration - especially trees. However, as you can see from her brand new Etsy store, there are other motifs which inspire and will make great special interest gifts. 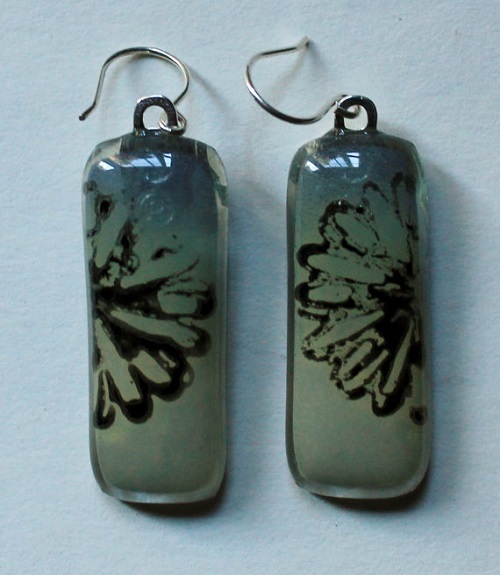 She takes advantage of glass transparency to add layers of complexity to her designs. 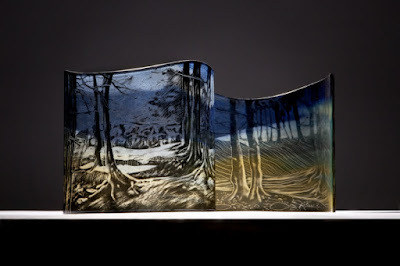 What she does is paint with vitreous glass enamels. 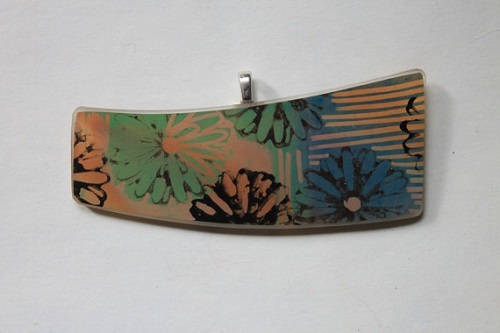 She also does multiple kiln firings to create layers of color. Her virtuosity with earth tone and soothing colors is lovely. 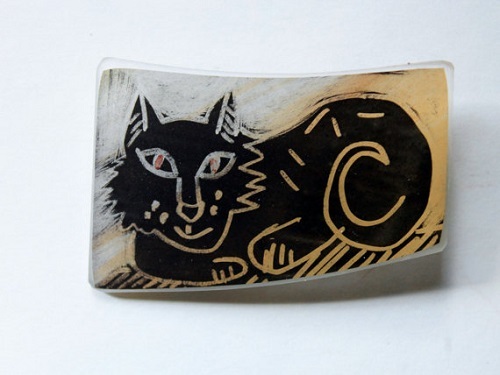 Sandblasting, etching and other media collages are some of the techniques used to create her one of a kind designs. 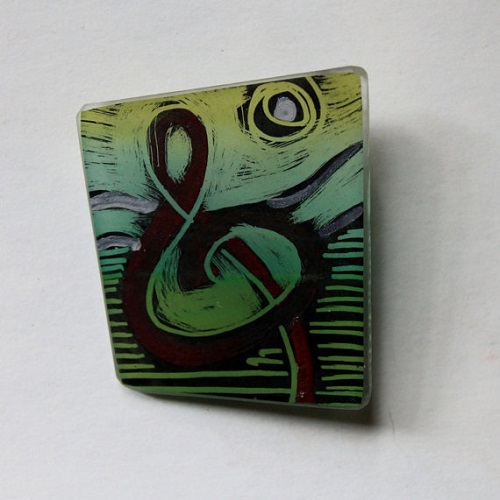 Shown here are her scraffito designs on pins, pendants and earrings. 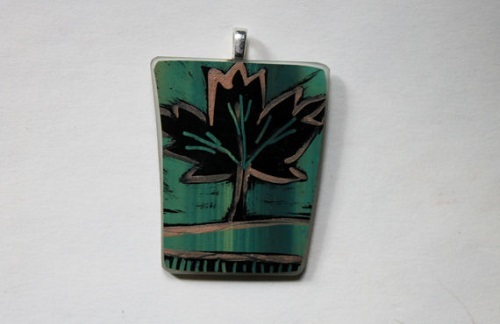 I bought a maple leaf pendant something reminiscent to this one below. Not the same because all her work is one of a kind. I can honestly say the pictures here just don't do her work justice! Her larger art sculptures are also stunning. No wonder her work has been exhibited across Canada. She still teaches at the Wellington County Museum doing summer workshop season, and also in her own studio. Heather accepts commissions. If you'd like to win Heather's wonderful hand painted artwork to the tune of $45 worth, please make a comment below. Make sure you leave contact info below if you do not have an online shop or blog. It ends in a week's time at 6 pm EST Monday, November 7, 2016. I will pick the winner randomly and announce the results as soon as possible after. So be sure to leave a contact email if you don't have an online link or make sure you come back and check! Otherwise I will redraw in a week. Good luck! Wow! So cool!I'd love to win these beautiful pieces. Thanks for the opportunity! Wow! Her work is beautiful! I would love to create a special necklace to show off one of her pendants. Pearl, as always, thank you so much for all you do for the beading/jewelry community. I always enjoy your blog & Facebook posts. Would I??? What an incredible offer Pearl! And Heather is from my home town as well! I've always known that living in Guelph created some amazing artists!! What beautiful work! LOVE the tree!!! Very original! Original and beautiful work, As always, thank you Pearl. Blog follower: zoowatcher10@yahoo.com. Her work is beautiful and inspirational! I can see why you love it, Pearl! Thanks for introducing us to this talented artist! Heather's work is So Beautiful!! Beautiful works of art! Thanks for the chance to win. What unique and beautiful work! Thanks for introducing Heather! 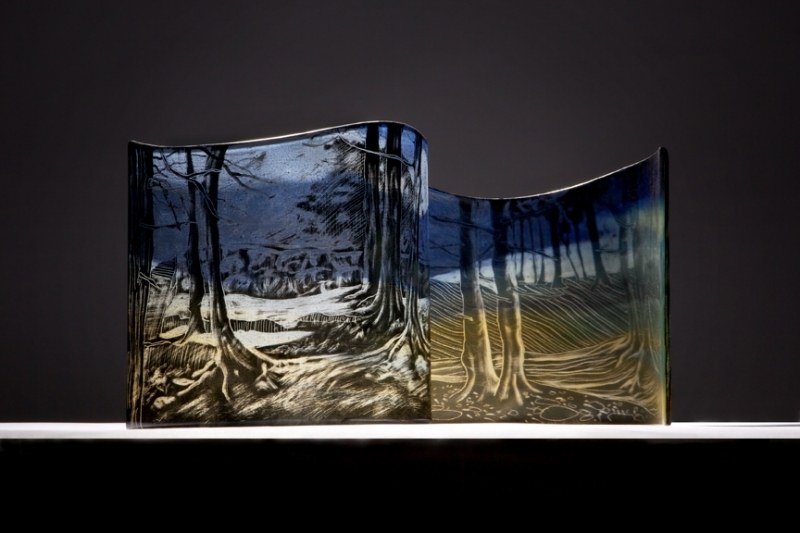 Beautiful glass artistry. I would LOVE to have one! Such beautiful and creative pieces...It would be a pleasure and honor to wear them. Such amazing beauty in her work. How wonderful it would be to have something she's made. Very original work. Very nice. I am a blog subscriber. I've been to a couple of shows where Heather has her art and I'm always amazed at the quality and originality of it. Just love her work! This is one of my favourite artists.